Our Ford dealership is proud to offer a large selection of new 2016 Ford Super Duty trucks in the San Francisco Bay area. These reliable workhorses are constructed with a solid steel foundation and available in a variety of body styles. The Ford F-250, F-350 Super Duty truck models are available as the Lariat, King Ranch or Platinum editions. Many cabin size options also exist including the regular cab, crew cab and super cab body styles. 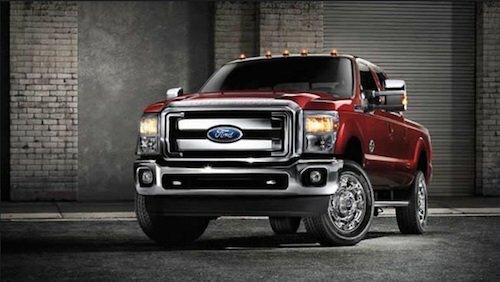 Ford Super Duty trucks are powered by a standard 6.2L V8 engine that delivers best-in-class gas horsepower and torque. For ultimate strength a 6.7L Power Stroke diesel engine with best-in-class horsepower and fuel economy is also available. Both engine types are mated with the Ford TorqShift 6-speed automatic transmission for excellent high torque performance and dependability. Plenty of smart technology to assist with heavy duty hauling and towing is onboard these new heavy trucks as well. An AdvanceTrac with RSC and trailer sway control, Hill Start Assist and Hill Descent Control and Integrated Trailer Brake Controller are just a few examples of features that allow Ford Super Duty trucks to deliver best-in-class towing. Super Duty trucks are not only built to offer superior strength and durability but they are also designed to be a mobile office. The interior is packed with storage options such as under seat compartments, and a lockable middle console storage area large enough to house a laptop and hanging file folders. There are also plenty of power access points throughout the cabin. An available LCD productivity screen which provides fuel economy data, towing and off-road information combined with the available SYNC system for hands free calling and voice command features, offer all of the information and connectivity an offsite business requires. We invite you to come test drive a new 2016 Ford Super Duty truck near San Francisco, California soon and discover all of the possibilities this remarkable work truck has to offer.